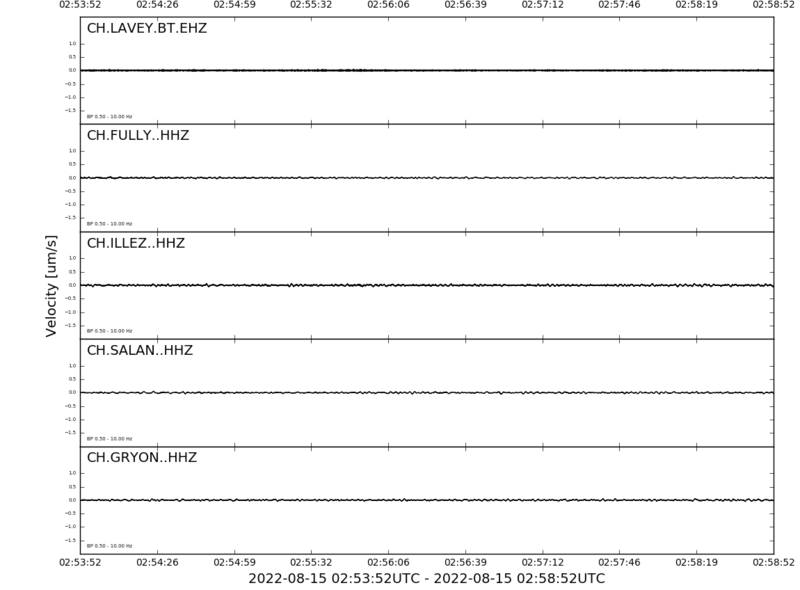 The following figures show seismograms recorded by the monitoring stations in the Lavey-les-Bains area. These seismograms represent the development of ground motion (vibration velocity) over time, recorded at earthquake stations LAVEY.BT (GEOBEST), FULLY (GEOBEST), GRYON (SDSNet), ILLER (GEOBEST) and SALAN (SDSNet) within the past five minutes. The times indicated on the horizontal axes correspond to Coordinated Universal Time (UTC). The time normally used in Switzerland is Central European Time (CET), which is one hour later than UTC. During Central European Summer Time (CEST), Swiss time is two hours ahead of GMT. The vertical axes indicate ground velocities in microns per second (μm/s). The seismograms are filtered before being presented (using band-pass filter from 2 to 10 Hz) to make small local earthquakes more clearly visible.